Bun rack and pan cover comes in a compact packaging which helps save on counter space. Quick-dispensing for reduced waste and easy access. 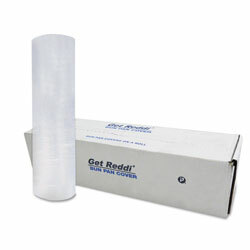 Made of clear LLDPE film making it tough and resistant to acids, bases and vegetable oils. FDA approved for adequate food service, storage and handling. Food Container Type: Carryout; Material(s): Linear Low-Density Polyethylene; Color(s): Clear; Depth: 35". 1 Bakery Rack Bakery Bags from Inteplast Group! 200 In Stock today.